I’ve found that once August rolls around, evenings get incredibly vibrant, color-wise. And incredibly hot. And the last thing I want to put on for a night out is a pair of jeans… humidity + heat + sweat = no bueno. My favorite solution? A lightweight skirt. A friend at my summer internship, Olivia, wore this skirt earlier this summer and I remember thinking how adorable and expensive it looked. The print and pleated detailing caught my eye immediately. Imagine my delight, therefore, when I found it at H&M! The best feeling. With a light J.Crew button down and my go-to Torysandals, it made for a perfect, easy evening ensemble. It’s been forever since I’ve been in H&M and I need to go back! 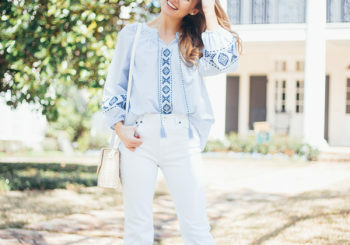 Your outfit is so pretty and perfect for summer or fall! Happy Wednesday! I love a dress or a skirt for those hot, humid nights! I absolutely love this whole look! love this look! definitely need to know what nail polish that is! i am IN love!